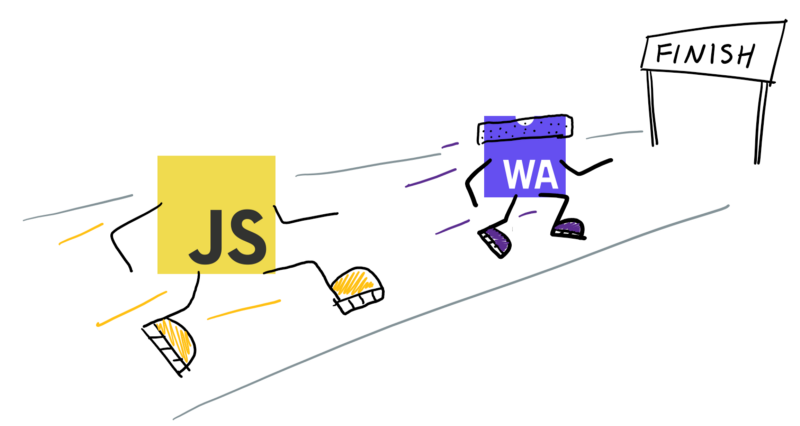 The web just got a lot faster with WebAssembly, the low-level assembly-like language and compile target. The standard has reached cross-browser consensus and WebAssembly is now available in the latest Beta version of Samsung Internet (v7.2.10.12). For more background info on Web Assembly, see the article on MDN Webdocs. The third implementation takes advantage of a technique called blocking. 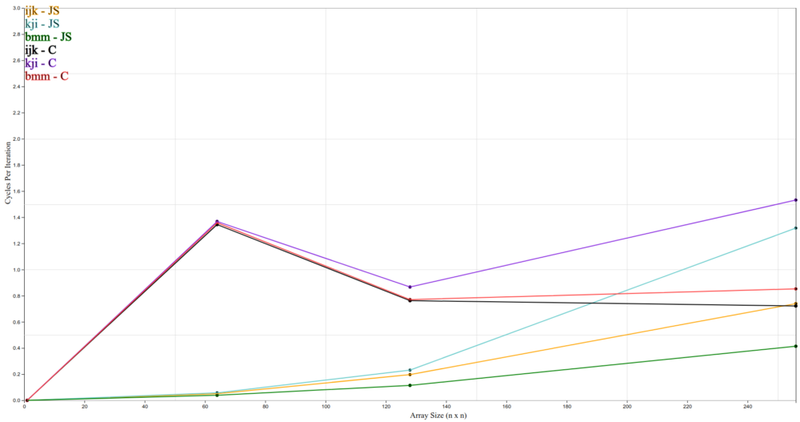 Blocking takes advantage of temporal locality to increase cache hits. The block size I chose for this experiment is 32, because the array sizes are divisible by 32, and I already know small block sizes work well. I also did block sizes of 8 and 16 as well. 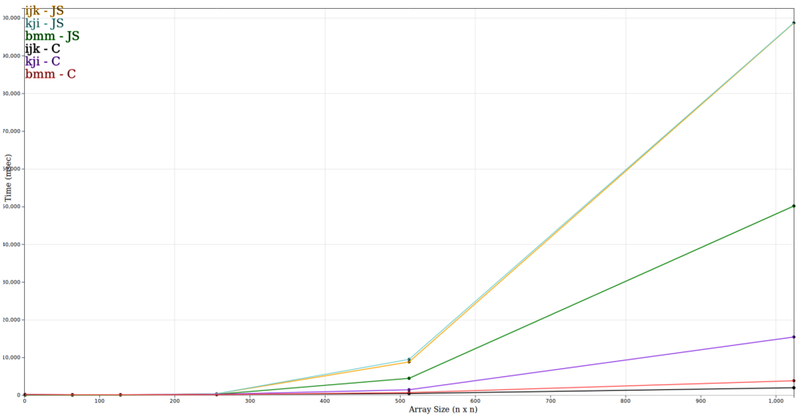 These graphs below show the time (milliseconds) for different array sizes ranging from 64x64 to 1024x1024 for each of the above implementations (ijk, kji and bmm ). Before I breakdown the results, I want to note a few things. 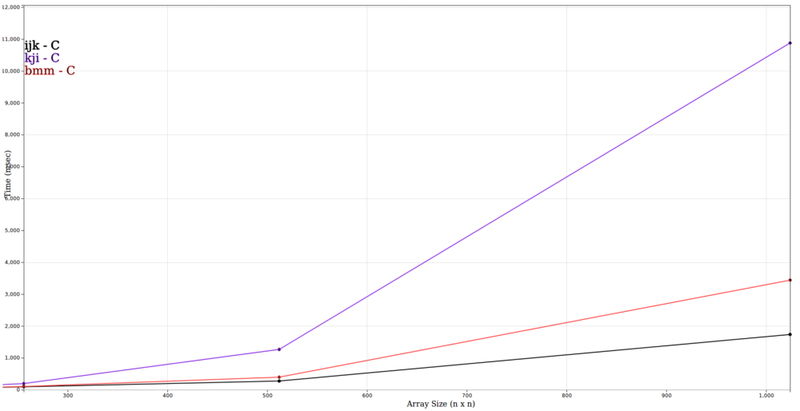 First, I added an array size 1 to get rid of ‘noise’, where the ijk implementation in C++(black line) time for array size 1 x 1 is slower than an array size 64 x 64 according to the graph. 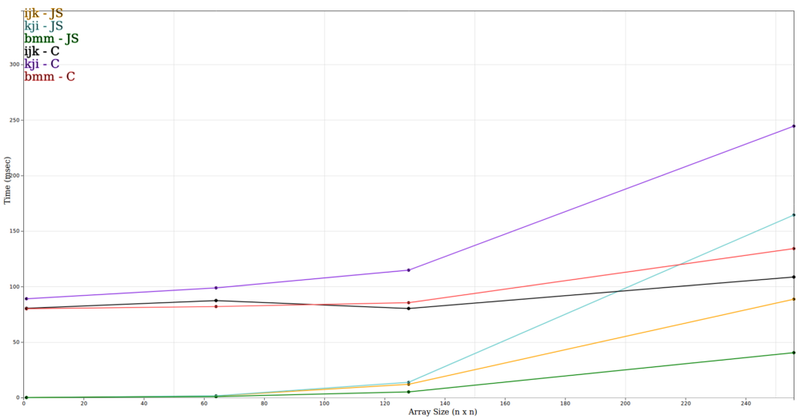 The same would happen if I started at 64 x 64, where 64 x 64 was slower than 128 x 128. Second, the results are an average of of 25 runs. CPUs typically have multiple workloads which can add some overhead from context switching to a single run of any of the above functions. 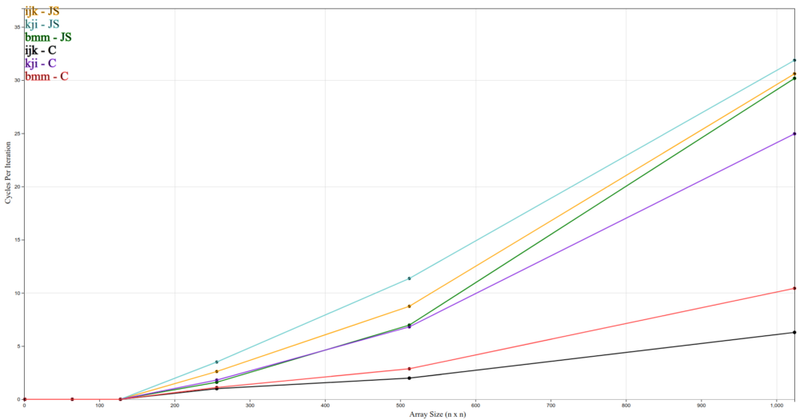 Taking the average of multiple runs helps converge to a more accurate measurement. You can find the source code to this experiment here. You can also try this out in your browser here. The latest Beta version of Samsung Internet (v7.2.10.12) supports Web Assembly, so feel free to test it out and tweet us (@Samsunginternet) how you utilize Web Assembly. Future stable releases of Samsung Internet will support Web Assembly too. By Winston Chen on May 2, 2018.